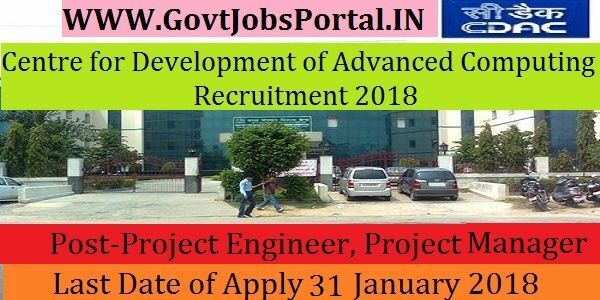 Centre for Development of Advanced Computing is going to recruit fresher candidates in India for Project Manager, Project Engineer & Project Support Staff Posts. So, those candidates who are willing to work with this organization they May apply for this post. Last Date of Apply 31-January-2018. Total numbers of vacancies are 53 Posts. Only those candidates are eligible who have passed Ph.D in Science or Engineering or Technologies as relevant to the job description or B.E./ B. Tech. and M.E./ M.Tech with 1st class in either B.E./ B. Tech. or M.E./ M. Tech. degree in Electronics/ Electronic & Communication/ Computer Science. Indian citizen having age in between 20 to 50 years can apply for this Centre for Development of Advanced Computing Recruitment 2018. Educational Criteria: Only those candidates are eligible who have passed Ph.D in Science or Engineering or Technologies as relevant to the job description or B.E./ B. Tech. and M.E./ M.Tech with 1st class in either B.E./ B. Tech. or M.E./ M. Tech. degree in Electronics/ Electronic & Communication/ Computer Science.